The Church of St Lawrence at Falmer was the Parish Church for Bevendean Farm until the formation of the Parish of Moulsecoomb in 1931. The first church was opened in 1922. The current building was dedicated in June 1934. The parish of Moulsecoomb was established in June 1931 and included Bevendean and Coldean. A former 16th century Cowshed from Bevendean Farm opened as a church in 1953 and used for 10 years. This church in Norwich Drive replaced the Barn Church in 1964 and was used as a church until 2007. It is now used as a community centre. The church is a converted farm barn c1800, which was dedicated in December 1955. A new entrance and the hall were built in 1971. 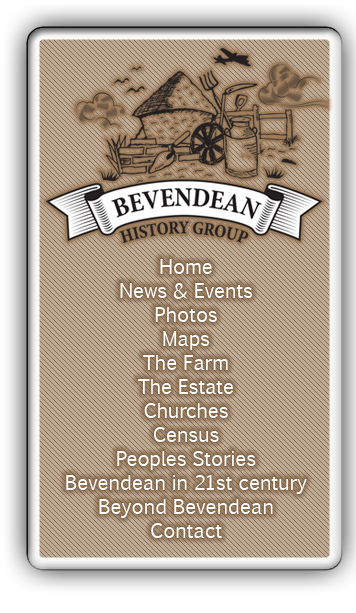 The church was opened in 1914 and used by people from Bevendean Farm as it was closer than Falmer in the late 1920s and early 1930s. It closed in 2006 and was demolished in 2013. The church was rebuilt in 1838, at the expense of the Earl of Chichester. The church was declared redundant in 2008.